What is this and how do I prevent my baby from getting it? Here's all the answers you need. How do I tell that my child is too sick for daycare? How do I tell that my child is too sick to go to daycare? I work full-time and can't take off very often, but don't want to make things worse by sending him to daycare when he is sick. Will labour complications effect my child's development? If a baby's head gets stuck during labour because of a contraction and had low blood oxygen level after birth could these affect that child later on like developmental delays or etc? Why does my baby cry when she drinks formula? This mom can't seem to get to the bottom of her baby's crying when being fed, an expert weighs in. Will the way my baby crawls have an effect on her development? My baby crawls on her bum, froggy-style. She has never crawled on her hands and knees and shows no inclination of ever doing so. What long-term effects will this have on her development? Whenever he gets frustrated by something, my 10-month-old arches his back and throws his head back. I'm worried that he'll hurt himself. Is this normal behaviour? My newborn just doesn't stop crying. Is it colic? My two-week-old baby just doesn't stop crying. My mom says she has colic, but I don't even know what this is. What do you think? Are fat babies healthier than thin babies? My newborn seems really skinny- he has no fat on his arms or legs. I've heard that fat babies are healthier than thin babies and I want to start giving him some cereal to fatten him up so he can be healthy. Is this true? 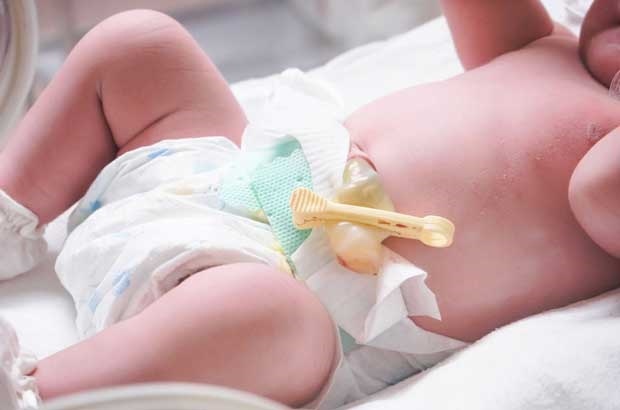 How should I take my baby's temperature? How should I take my baby's temperature to get the most accurate reading, and what is the best kind of thermometer to use? My baby's legs turn outward, is there something wrong? My baby's legs turn outward, with her toes pointed inward. Is there something wrong? At what age will my baby start sleeping through the night? My four-week-old baby has not slept through the night once and I am just exhausted! I'm worried that there's something wrong with him that he's not sleeping through. At what age can I expect him to sleep through the night and how can I get him to do this? Is my baby old enough to sleep through the night? My eight-month old son needs a predictable daytime sleep routine, but with my hectic life this is quite difficult. He also wakes up several times at night and I am exhausted! Is he old enough to sleep through the night? I'm struggling with breastfeeding. I am not producing enough milk at all. I've tried using a breast pump to stimulate more prodcution, but can only produce 40ml at most each time. I don't want to put my baby on formula. What can I do? My baby doesn't like spending time on her tummy. More often than not I just give up the fight, but her neck is still floppy and this makes me worry. What should I do about this? My baby has what looks like a large pimple at the site of her BCG injection. It's very red and inflamed and it seems as if some pus is coming out of it. Should I try to pop it or rub anything on it to help my baby feel better? My baby is 15 moths old, and he hasn't yet cut even one tooth. I'm worried that I'll be seeing that gummy grin forever! Is there any way that I can get him to start teething? How can I get my 4-week-old to sleep through the night? My four-week-old baby has not slept through the night once, and I am just exhausted! At what age can I expect him to sleep through the night, and how can I get him to do this? How do I get my toddler interested in a variety of foods? My two-year-old used to eat absolutely anything I gave him, including vegetables and even sushi! However, he's developed a sudden fussy streak and insists on only eating Marmite toast and cucumber sticks. Is this normal? And how do I get him interested in variety again? Is my 18-month-old ready for nursery school? I want to put my 18-month-old in a nursery school so that he gets to play with his peers and gets the right kind of mental stimulation. I'm worried that he's a bit young though. How can I tell that my little boy is ready for this step? Should I move away from purees and start with textured food? I started my seven-month-old on solids about three weeks ago, and she's doing quite well. However, I've read that texture is important for her development, so I'd like to know when I should move away from the rice cereal and smooth purees to start introducing textured food, meat and finger foods?